As a leader in the automotive industry for over a century, Ford has spent 96 of those years supporting disabled military veterans. As technology and modern infrastructure evolve, so too do Ford’s methods of providing assistance to a portion of the American public that Ford Motor Company Fund and Community Service president Jim Vella feels is more deserving than perhaps any other. 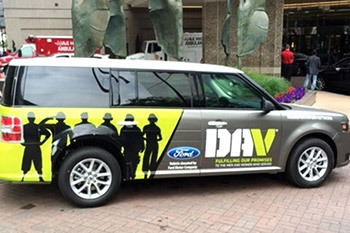 Since 1996, Ford has donated 199 vehicles to DAV. “We are proud to be able to help these heroes of freedom get the critical services they need to make their lives better,” Vella said in a statement announcing Ford’s donation of 7 Ford Flex utility vehicles to DAV (Disabled American Veterans.) These vehicles will enter the fleet of DAV’s transportation network, whose volunteer drivers transport sick and disabled veterans to VA Medical Centers all over the country. DAV members receive discounts on Ford and Lincoln vehicles, as well as a reimbursement on adaptive equipment to allow them to better access and drive their vehicles. 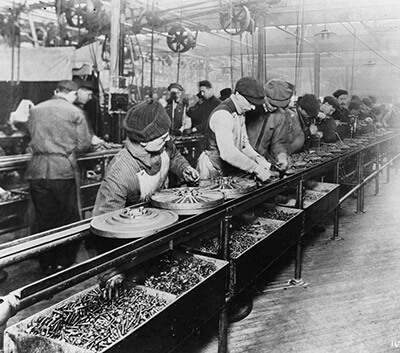 Ford has concerned itself with assisting veterans since 1919, when Henry Ford saw the plight of soldiers returning from the First World War and hired disabled vets to build his cars. Ford recently teamed up with BraunAbility, the world leader in wheelchair-accessible vehicles, to create the BraunAbility MXV, the world’s first wheelchair-accessible Ford Explorer. Veterans confined to wheelchairs have historically had their vehicle selection limited to vans, minivans, and the occasional pickup, but the MXV breaks ground in the field of wheelchair-ready SUVs. 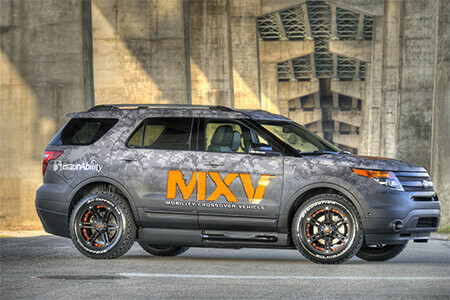 The BraunAbility MXV will go on sale this fall, but the first model has already found an owner. Lance Corporal Mike DeLancey, who was left paralyzed by a sniper’s bullet while serving as a Marine in Iraq, was presented with the first-ever wheel-chair accessible SUV at a moving unveiling ceremony. While some efforts to support veterans and people with disabilities grab headlines, Ford’s Military Appreciation program, as well as its Mobility Motoring program, provide financial assistance every day. If you are a veteran, are living with a disability, or are a caregiver for someone with a disability, we would be happy to help you find out if you qualify for a rebate on our star-studded Ford lineup! Didn’t even know about Ford’s Military Appreciation program or its Mobility Motoring program. Thanks for sharing. Hi Sandra, we’re glad you heard about it! We’re glad to work for a company that appreciates those who have given so much for our country.